Add a vacuum pump or limit switch? This flexible design, available with or without an attachable vacuum unit, enables the school or professional to upgrade equipment as needs change. Optional Vacuum Upgrade: 1/3 HP, 5.3 Amps, 115 VAC, 60 Hz, pump w/ fittings. Optional 220 volt model upgrade available above. Heavy-Duty Aluminum Body / Extremely durable design for both school and professional applications; die-cast body resists corrosion, preventing clay body contamination. Unique Flexible Design / Enables one to upgrade equipment as needs grow. Powerful 1 HP Motor / Blends and extrudes clay at 800 lbs/hour. Special Triple Safety System / Ignition key prevents unauthorized use; limit switch stops auger when exposed; prominent emergency stop button. Stainless Steel Auger / Non-corrosive surface easily moves clay through barrel. Retractable Clay Rest / Convenient for bagging clay; slides under pug mill to save space when not needed. Easy Disassembly Bolt System / Designed for easy removal of barrel top, allowing for thorough cleaning of interior. 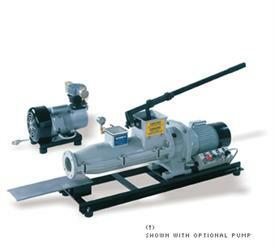 Optional Vacuum Attachment / Models PM-071V & PM-071V-LS Powerful 1/3 HP pump is compact and easy to attach; operates at the f lip of a switch with minimal depreciation of lbs/hour capacity . One Year Warranty / Peace of mind. SHIP WEIGHT: 190 lbs. or 230 lbs. with pump.